Want to use this infographic on your site? All I ask is that you add a link to this post where you publish the infographic, and you keep the infographic as is. 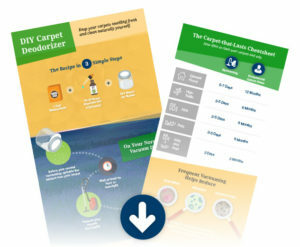 Don’t forget the carpet warranty – recently bought carpets will include instructions for carpet cleaning, often requiring professional cleaning at least once a year. There’s clean, and then there’s clean smelling. Imagine waltzing into the room, the carpets are clean, fluffy, and looking fresh… and a natural, uplifting scent gently floats to your nose. Your day is officially brightened. Your mood brightens just a little at the natural scent, without a chemically induced Glade plug-in deoderizer in sight. Your kids are safe, your pets are safe, but there’s that little extra in the air making you feel good. Cleaning and vacuuming will get rid of the dirt and keep your carpet healthy, but why stop there? Carpets can be the armpits of your home, and could use a little deodorizing of their own to keep them and the entire room smelling wonderful. 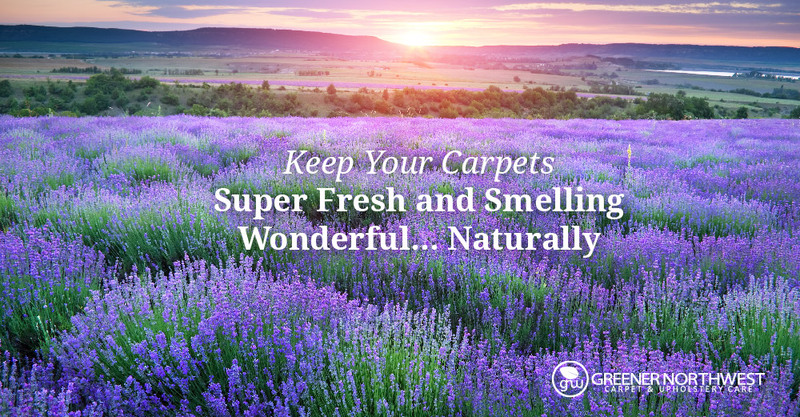 A few simple make-at-home, natural solutions will help between cleanings to keep your carpets smelling fresh and wonderful. They are super-easy, natural, and can shaken over the carpet shortly before vacuuming to further clean and deodorize. Baking soda, as seen in our green cleaning recipe guide, also helps to add a little extra cleaning power. Just vacuum it up after it’s had some time to do it’s magic! Of course, not all cleaning is set to a schedule. Alert the emergency response team! Quick action is critical for those sudden surprises to keep your carpet clean and get the best results before you call in the professionals. Don’t scrub – carefully blot the stain! But be careful. If it’s just not coming out, hire a professional. Overdoing the DIY stain removal can make the situation worse, and actually make it harder for the professional to clean out the stain. Carpet indentations not rebounding to that smooth even surface you want? I know, as soon as you notice them they stand out like a giant zit on the face of your carpet. But… as we revealed in our article on reversing carpet indentations, there’s a magic trick to try. If nothing else worked, try placing small cubes of ice in the indentations. (Don’t overdo it! Just small pieces so you don’t soak your carpet) As they melt, watch them help bring those downtrodden indents back to life. That musty, moldy smell that seems to infuse the room. Sad news, friends… if mold has truly set hold, it’s already too late. So clean early and often and don’t ever leave a water saturated carpet. If you sense a slight moldy smell happening, get it professionally cleaned right away in the hopes you got it early enough. The moisture is seeping into his furniture and starting to mold in the carpet. Mold spores are spreading deep in the fibers. It’s growing into the padding beneath the carpet. The problem is all of the microscopic pores in the fibers and the padding for the mold spores to hide in and make it impossible to thoroughly remove. If you catch it early enough, a good, thorough carpet cleaner can help. If it’s really set in, it may need to be replaced. The deoderizer recipe shown above, given ample time to do it’s it thing, before vacuuming thoroughly. Diluted white vinegar – equal parts water and vinegar sprayed lightly to the musty area and blotted up with a white cloth or sponge. Dry as quickly as possible, and check for any discoloration effects first. If the musty smell is coming from the padding beneath the carpet, I’d hire a professional.